Simprolit monolith represents Simprolit polystyrene concrete poured into the formwork directly at the construction site, produced according to the Technical conditions issued by the license holder. Simprolit monolith and structures made of it are non-flammable (flammability class NG) and at the time it is the only polystyrene concrete with such characteristics, with each day, the application of Simprolit monolith is increasing not only in building construction, but also in road and railway construction and hydrotechnics. protection of corrugated metal sheet roofs, where Simprolit has not only an isolating, but also a unique fireproofing function. the unique ability to increase the fire protection of corrugated sheet covered roofs. 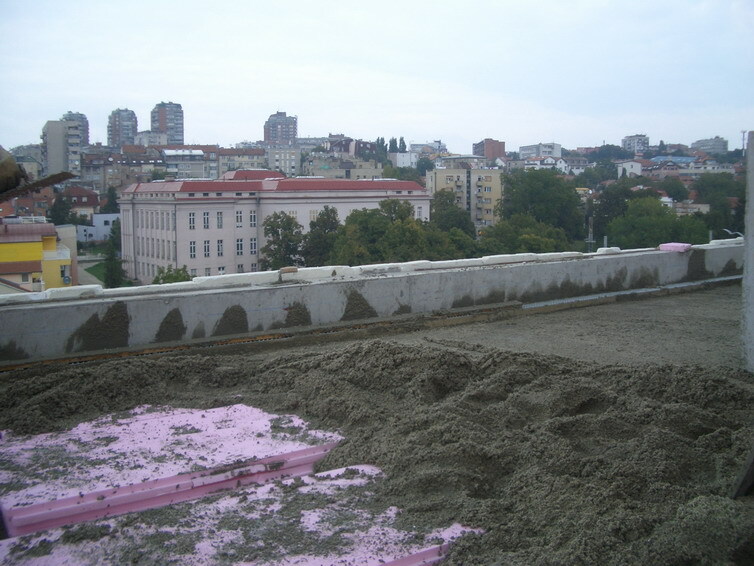 Durability of a flat roof depends to a great extent on the physical-mechanical properties of the applied thermo-insulation layer. with application of mineral wool or styrofoam for thermo-insulation of corrugated metal sheet roofs, the fire resistance of the roof becomes significantly reduced and the risk that the fire could rapidly spread over the whole building through the roof structure becomes higher; the reason for this is very simple the ribs of the metal roof sheet together with thermoinsulation panels form a system of air channels through which the fire could easily be spread over the whole building, "jumping over" the fire-protective separation walls underneath. 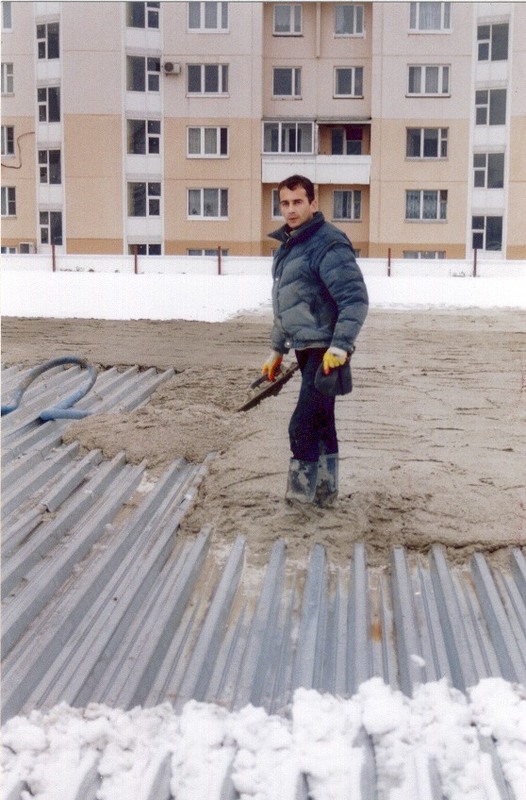 After several cases of buildings heavy damaged in fire and especially after a big thermo-energy plant sustained a severe destruction, the Russian Academy for Communal Management and some other meritory organizations made "Technological regulations" for design and building of corrugated metal sheet roofs, recommending application of Simprolit monolith as the best solution. by using the Simprolit monolith on a corrugated metal sheet roof the channels between metal ribs are filled with this monolith, increasing not only the resistance capacity and fire-safety of the roof structure, but also significantly improving its corrosion resistance, rigidity and strength when subjected to statical and occasional dynamical loads. Simprolit polystyrene concrete is ideal for facade ornaments, attics, capitals, balusters etc. For example, the slope-shaped facade ornaments designed for a Moscow building, with dimensions 40/60,45,30,15/10cm and with calculated weight of 625 kg/m (plus the additional necessary plastering), were successfully replaced by Simprolit monolith made ornaments that had the same shape, but better quality and weight of just 45 kg/m (together with finishing). By application of Simprolit monolith, the Architect gets a quality material that doesn't restrict his free architectural expression. It also helps in solving a lot of problems concerning the fulfilling of requirements issued by the authorized Institutions for protection of architectural inheritance and ambiental environment. On the other hand, the problems related to the steam permeability, relatively large weight of facade ornaments, their frost and humidity resistance, or consequently the problem of facade durability in contemporary architectural buildings are easy to solve. In order to make a base layer for final flooring (parquetry, linoleum, ceramic tiles, etc.) 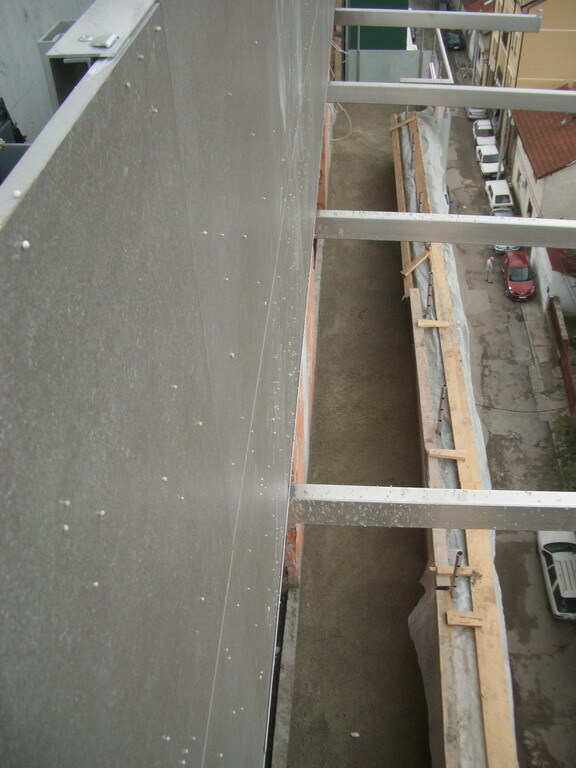 and to level the floor, a 30-50 mm thick cement screed is usually placed on the top of the slab. As a rule, this cement screed is placed over certain thermo-insulating and soundproofing layers, in accordance to the specifications of the valid building regulations. In order to prevent crack appearance, specific chemical admixtures or physical components (such as metal, glass or plastic fibers) are added to the screed. On the other hand, this makes the building procedure more difficult and significantly increases the total costs. There is also a well-known problem of building in very short time limits. Namely, even well organized civil engineering firms that can finish three or four storeys of a concrete structure in a month, are forced to wait for another 28 days until the cement screed becomes dry and ready for flooring. while a 5 cm thick cement screed weighs around 110 kg/m2, a Simprolit monolith screed of the same thickness weighs less then 18 kg/m2. In this way, using Simprolit monolith as a leveling screed and a base layer for final flooring, the load carried by the structural members (beams, columns, bearing walls and foundations) is significantly reduced - which directly results in lesser dimensions, reduction of the necessary reinforcement and smaller weight of the bearing elements. 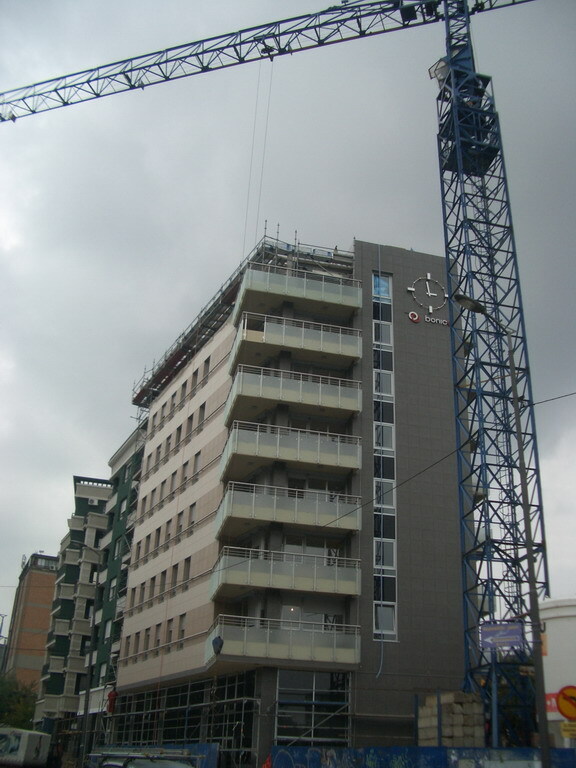 This has also a direct influence on the total price of the structure (for example, if a cement screed of an 11-storey building gets replaced by a Simprolit monolith screed, a complete load carried by the foundation plate is reduced by more then 1000 kg/m2 -which practically means that an additional storey could be built without change of the load). Hydro and thermo insulation of foundation plates are usually installed using one of the following ways: either the hydro isolation layer is put under the foundation plate and thermo insulation is put over the plate (inside the building), or both insulation layers are placed on the top of the plate, i.e. inside the building. Both of the given solutions have certain disadvantages. In the first case, if the hydro isolation is put under the foundation plate and next to the outer side of the foundation wall (creating a "watertight vessel"), there is a permanent danger that significant building settlements may appear, damaging the hydro isolation and leaving the building unprotected. Besides, the thermo-insulation placed on the top of the foundation plate (inside the building), has to be protected from the steam and mechanical damages. In the second case, if both hydro and thermo insulation are put on the top of the foundation plate, the moisture and underground water penetrate easily through the foundation plate, representing a latent danger for building's stability and durability; besides, the insulation layers placed on the top of the foundation plate reduce the usable cellar height. 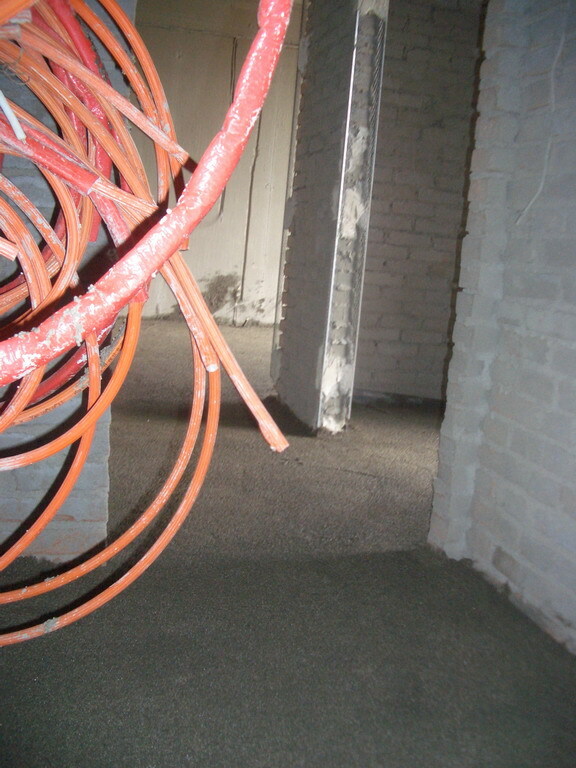 For thermo-insulation of foundation walls at the depth of freezing it is strongly recommended to apply the hydro isolation over the thermo-insulation layer (between this layer and the earth) and by no means under the thermo-insulation layer (between this layer and the foundation wall); if this rule is neglected, the thermoinsulation (mineral wool, styrofoam, styrodur) loses its basic function and in time its physical properties and integrity, as a result either of aggressive underground water influence or freezing effect. 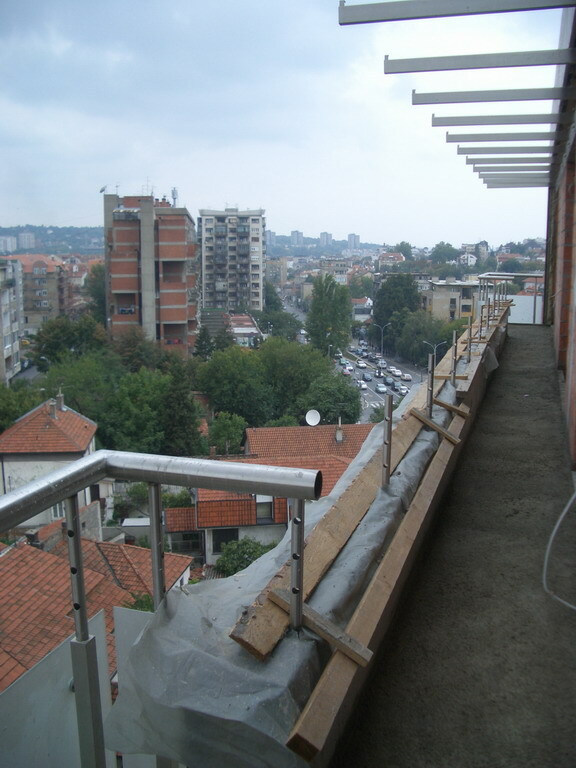 Therefore, it is necessary first to cover the facade walls with thermo-insulation, and after that to place the hydro isolation layer and its protection against mechanical damage. 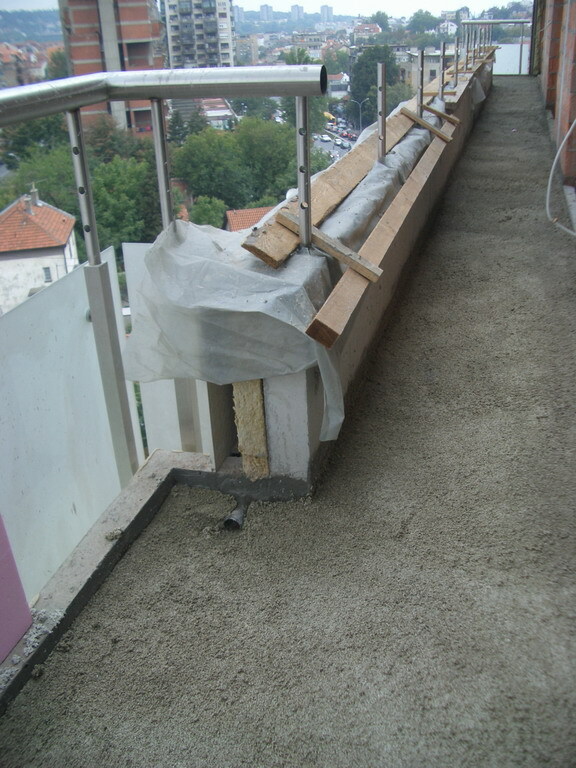 On the other hand, this procedure implies prolongation of the building deadlines, increased complexity of the working processes, and consequently bigger total expenses (leaving the problem of the horizontal and vertical hydro isolation joints - between the foundation plate and foundation walls, unsolved). whereas the thickness of the upper Simprolit monolith layer (located above the hydro isolation, just under the concrete plate) has to be determined using thermophysical calculation, and the thickness of the lower Simprolit monolith layer (serving as a base for the hydro isolation) is determined depending on the applied Simprolit monolith class, defined by its compressive strength (minimal thickness of 40mm is recommended for this layer). Nowadays, there is a frequently used method in which polystyrene monolith concrete is casted between two asbestos-cement (?salonit?) boards, in order to avoid plastering before final painting of the walls. 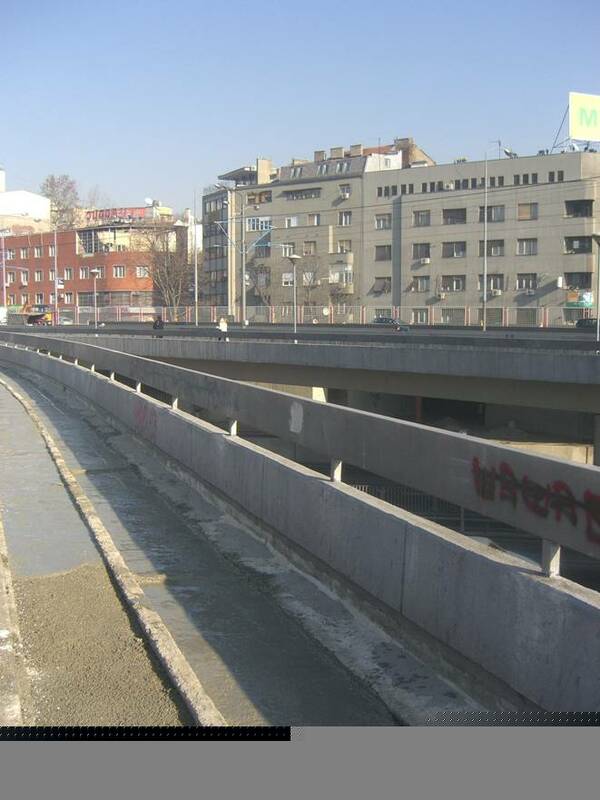 and the greatest danger represents the existence of the excess water left in the polystyrene concrete after casting; namely, there is no possibility for this water to evaporate and only a few freeze-thaw cycles could lead to significant damage, or even to complete destruction of the wall. Therefore, it is recommended to build this type of walls using the formwork with at least one removable side. A procedure where structural members (walls, plates, domes, etc.) are made by casting of Simprolit monolith using a two-sided formwork with one removable side (the other side of the formwork may be for instance a Simprolit one-layer or three-layer panel) around the bearing metal structure has several advantages. Not only that it keeps the building warm and reduces the total load carried by the metal structural members, but also serves as a protection against corrosion and fire. Besides, the application of Simprolit monolith offers the possibility of simple construction and mounting of structural members. For example, building of large span domes using Simprolit monolith and the metal sub-structure solves not only the problem of thermo-insulation, but also reduces the total weight of the dome by more then 7 times (compared to the classic solutions). Also, it is possible to cast the dome on the ground and afterwards to lift it to the designed position, where it could be relatively easy mounted.